Copyright: © 2014 Franco R. This is an open-access article distributed under the terms of the Creative Commons Attribution License, which permits unrestricted use, distribution, and reproduction in any medium, provided the original author and source are credited. The amyloid precursor protein (APP) is mainly known for being the precursor of the ß-amyloid peptide, which accumulates in plaques found in the brain of Alzheimer's disease patients. Expression in different tissues and the degree of sequence identity among mammals indicate an essential and non-tissue specific physiological function. APP is anchored to the membrane and displays a single C-terminal intracellular domain and a longer N-terminal extracellular domain. The basic biochemical properties and the scattered data on research, not related to production of beta-amyloid peptide, suggest that the protein and the molecules resulting from APP proteolytic cleavage may act as adhesion factors, enzymes, hormones/neurotransmitters and/or protease inhibitors. APP deserves to be known for its quite notable properties and its physiological role(s). The number of papers related to amyloid precursor protein (APP) as of September 2014 is 30,075. Of those, papers in this Century are 24,390 (81% of the total), indicating that APP is one of the most studied proteins. Information is useful but excess of data may be counterproductive by the risk of losing the perspective to fully apprehend APP biological clues. A key issue in understanding APP biological relevance is to focus on its physiological role(s). As every other protein, APP may have different roles; a main one and other(s) possibly less relevant. This certainty drives scientific research. Due to enormous interest related to accumulation of a degradation peptide, beta-amyloid (Aß) peptide, in the brain of Alzheimer's disease (AD) patients, APP research is biased towards the central nervous system (CNS) and mainly driven by its relationship with the amyloid-hypothesis of AD. The protein is widely expressed and is highly conserved among species; therefore its physiological function must be essential and non-tissue specific, i.e. not necessarily centered on the nervous system. In this perspective paper the focus is placed on aspects apparently attracting less interest in the field, namely the possibility of i) a relevant role of carbohydrates in APP function, ii) differential APP glycosylation in AD, iii) APP acting as adhesion molecule, iv) APP having enzyme activity, v) APP proteolytic cleavage providing polypeptides with hormone/neurotransmitter/growth factor potential, and vi) soluble APP acting as protease inhibitor in the CNS. APP acquired its present name after the discovery of its fundamental relationship with AD. In fact, one of the hallmarks of the disease is the presence of plaques formed by aggregates of a hydrophobic peptide of the protein in patient's brain. This cleavage peptide corresponds to amino acids 671-712 of APP and is known as ß-amyloid or Aß (1-40 or 1-42). In the NIH internet page "Genetics home reference" one may obtain information about the protein such as the official name, "amyloid beta (A4) precursor protein", or the alternative names for the APP gene or the gene product: "A4_HUMAN, AAA, ABPP, AD1, amyloid beta-protein precursor, amyloid precursor protein, APPI, cerebral vascular amyloid peptide, CVAP, PN2, PN-II, protease nexin 2, protease nexin-II". Very relevant for the present article is the information about its physiological function. In fact, in the same web page one may read: "Little is known about the function of amyloid precursor protein. Researchers speculate that it may bind to other proteins on the surface of cells or help cells attach to one another. Studies suggest that in the brain, it helps direct the movement (migration) of nerve cells (neurons) during early development". In this paper we will rescue important data of APP structure and putative function, and propose ways to advance in the understanding of the physiological APP role. It is difficult to find proteins whose primary structure (amino acid sequence) is so conserved among mammals. There is a 96.6% identity between APP sequence in mouse and human. A similarly high mouse-human degree of homology is found for a relevant protein in muscle function, creatine kinase M-type. The mouse-human identity is 92% for one of the main G-protein-coupled receptors, the alpha-1A adrenergic receptor (92 %, same length, 466 amino acids). The mouse-human degree of identity in the sequence of adenosine deaminase, which has been studied in our laboratory for years and whose congenital defect causes severe combined immunodeficiency, is 83%. In addition, the deduced protein sequence derived from the cDNA sequence is 770 amino acids long in many mammals. Moreover, the APP protein is widely expressed in different tissues. These simple and easily obtainable pieces of information are extremely relevant and point to a fundamental physiological role. The primary structure deduced from the mammalian APP gene is quite unique1. For many proteins an extra amino acid does not result in any evident gain/loss of function2. If the protein has catalytic activity, the enzymatic and regulatory properties would not change much upon addition or removal of a couple of amino acids at the beginning (N-terminus) or at the end (C-terminus) of its sequence. The equal length of the predicted APP-sequence in many mammals unequivocally indicates that an extra amino acid has not been evolutionary successful, suggesting that length modification would result in a marked loss of function. Despite the genome and proteome are quite similar among mammals, equal predicted length [1,2] in the primary structure of proteins is more the exception than the rule. There are important proteins with equal length in human and mouse: glucokinase (465) or caveolin-1 (178). In contrast ubiquitin D has 165 amino acids in human and 162 in mouse, insulin precursor has 110 amino acids in human whereas the mouse has two non-allelic genes, one coding for an insulin precursor of 110 and for another of 108 amino acids. Metabotropic glutamate receptor is five amino acids longer than the human counterpart (1194 in human and 1199 in mouse). Dopamine D4 receptor, a G-protein-coupled receptor, is much longer in human (467) than in mouse (397). Whereas adenosine deaminase is longer in men (363) than in mice (352), a 363 amino-acid-long protein is also found in a variety of mammals: Pongo pygmaeus abelii (Sumatran orangutan), Callithrix jacchus (White-tufted-ear marmoset), Pan troglodytes (Chimpanzee), Saimiri boliviensis boliviensis (Bolivian squirrel monkey), Macaca mulatta (Rhesus macaque), Macaca fascicularis (Crab-eating macaque) (Cynomolgus monkey), Nomascus leucogenys (Northern white-cheeked gibbon) (Hylobates leucogenys) and Mustela putorius furo (European domestic ferret). However, identity in these sequences of equal length is quite poor (50%). In summary, APP is quite unique in having (among mammals) a totally conserved length and a very high degree of inter-species sequence identity. Alternative splicing of the APP mRNA leads to three forms of 695, 751 and 770 amino acids [2-6]. A fourth form of 563 amino acids that does not contain the Aß peptide sequence was also reported. Expressed in cell models, the 695 and 751 forms are further sialic-acid glycosylated and phosphorylated to add 20 kDa to the apparent molecular mass of the protein . Despite alteration of APP glycosylation has been reported in AD (see  for a review), the consequences of APP biochemical processing in both healthy humans and AD patients are unknown. Alterations in carbohydrate content of a heavily glycosylated protein, alpha1-antitrypsin, in cancer patients were investigated early in time . Since then, the methods for determination of carbohydrates in human samples have advanced considerably, and ultimate mass-spectrometry technology makes possible fast determination of the slightest variation in protein glycosylation . To look for APP glycosylation in different tissues and in AD could give light to the contribution of carbohydrates to the function of APP. Proteolysis may be regarded as a non-physiologically relevant step in protein degradation. Nevertheless, there are many examples about the relevance of proteolytic events such as the cleavage of pro-insulin to give the physiologically active hormone, or the activation of a digestive pro-enzyme to give the active enzyme (e.g. chymotrypsinogen converted into chymotrypsin). Importantly, even in such cases the research has focused on the active protein but not on the other proteolytic fragments. One would consider that short peptide fragments are not neutral but interact with intracellular or extracellular components. Do these natural degradation fragments have physiological functions? Considering APP, one can suggest that this is the case. In fact, if a protein has equal length in mammals and has a very well controlled proteolytic cleavage (Figure 1), the products of this degradation are predicted to be unique and with a physiological role. APP may be processed by the amyloidogenic pathway, which results in Aß peptide (a 40-42 amino-acid-long peptide), or by the non-amyloidogenic pathway. The amyloidogenic route has been considered aberrant as it produces a peptide that self-aggregates and that is enriched in the "amyloid" plaques found in the brain of AD patients. The amyloid hypothesis of AD, i.e. the assumption that Aß peptide production is key for AD pathology, has not provided the expected results in terms of adequate and effective medications for patients. All of the anti-Aß peptide approaches, whose description is out of the scope of the present article, have been unsuccessful . 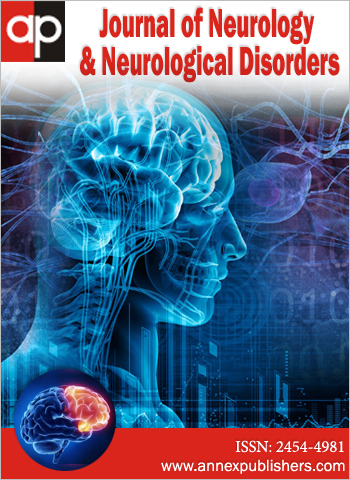 But what it is relevant is that the amyloidogenic pathway is not just restricted to the brain of AD patients; the pathway is also active in the healthy human brain. Again, the question that arises is similar to that above indicated: is there any physiological role for amyloid processing and for Aß peptide? It is very likely. Is there a role for the APP fragment remaining attached to the cell membrane? It is also likely. And is there a role for the secreted APP? It is likely as well. This section takes advantage of basic data on APP to highlight aspects that are usually forgotten and/or less commented. Pulse and chase experiments with radiolabelled sulfur were instrumental to know how APP is synthesized and processed. Synthesis of APP is followed by glycosylation, maturation, and rapid proteolysis to provide two stable fragments: a high molecular mass protein that is secreted and a low molecular mass form that contains the Aß peptide sequence and remains attached to the cell membrane [7,12,13]. Taking the basic structure of APP and its cell surface expression, a few are the physiological roles biting the bait. APP may be an adhesion molecule, something that to our knowledge has not been considered much despite well-substantiated evidence by Breen et al. (1991) and Coulson et al. (1997). Adhesion molecules have in common with APP the relatively long extracellular and the single trans-membrane domain [14,15]. They are also type-1 membrane proteins, i.e. they have the N-terminus at the extracellular side. Type-1 membrane proteins may also be differentiation clusters (CDs) in lymphocytes. Is APP expressed in immune cells? Yes, as summarized by Bush et al., in 1993: "APP exists in the blood as full-length, potentially amyloidogenic forms in platelets, and as an attenuated species in plasma and T-lymphocytes" . APP-independent amyloid deposits may be found in human pancreas. Islet amyloid polypeptide (iAPP) is considered a pancreatic hormone and comes from the degradation of a 90 amino acid precursor protein (the length varies among mammals). The predicted amino acid sequence identity for this hormone is less than that displayed by APP (versus human: 89% in cat, 84% in rat and mouse, and 78% in guinea pig) . By analogy, peptides coming from APP processing may be messenger molecules (hormones or neuromodulators/neurotransmitters). As we understand it, hormonal signaling can be autocrine, paracrine and endocrine (Figure 2). Due to both the widespread distribution and the relatively small amount in plasma, soluble APP may not act as an endocrine hormone. However, autocrine and paracrine actions cannot be ruled out. Reports on Aß peptide function are biased towards understanding mechanisms of neurodegeneration. It should be however noted that Aß peptide seems to be protective in oxidative stress conditions. A controversy concerning whether Aß peptide is indeed toxic or part of a cellular defense mechanism exists in the AD field. The finding of intracellular Aß peptide accumulation in the brain of healthy humans is also consistent with a "normal" physiological role of the so-called amyloidogenic APP processing [18,19]. Quite remarkably, accumulation is not restricted to older individuals but occurs across all ages, i.e. also in infants . Of note, Aß peptide would require a carrier system for the uptake of the peptide that is, in principle, released to the extracellular milieu. APP processing in the endoplasmic reticulum with direct production of intracellular Aß peptide cannot however be ignored. Some controversial results on the in vivo studies of Aß effects were provided by Joseph et al., in 2001; in the authors' own words toxicity by the amyloid peptide is not proven: " … putative Aß toxicity… which still has not been convincingly demonstrated in vivo" . Could the Aß peptide act as an autocrine or paracrine hormone? Using recently developed label-free technologies it would be interesting to investigate if APP-derived soluble peptides can signal in neuronal primary cultures. CD26 is a differentiation cluster that has been well characterized in different tissues. CD26 interacts with other cell surface proteins, for instance with chemokine receptors  and plays a role in HIV-infection  CD26 was studied in intestinal mucosa as enzyme, dipeptidyl peptidase IV, and in lymphocytes as co-stimulatory molecule in T-cell activation [23-26]. Could APP have an enzymatic activity and be a co-stimulatory molecule in the immune system? For comparison purposes, it is important to note that soluble CD26 may be released from proteolytic cleavage of membrane-bound CD26 . In other words, circulating dipeptidyl peptidase IV (soluble CD26) results from shedding from cell membranes. The role of soluble CD26 is not totally known but the enzymatic activity contributes to regulate the plasma concentration of chemokines [28,29]. To our knowledge soluble CD26 does not have a specific cell surface receptor and therefore an endocrine/autocrine/paracrine function cannot be at present endowed. Also noteworthy is the identification of a cell-secreted protease inhibitor, protease nexin-II (PN-II) as identical to the deduced amino-terminal sequence of APP . The so-called secreted form of APP is in fact produced by proteolysis of the membrane-attached precursor. Due to enrichment in brain and to potent inhibition of blood coagulation factor XIa, PN-II, i.e. soluble APP, was proposed as a locally-acting cerebral anticoagulant . The Kunitz-type protease inhibitor domain in APP  indeed inhibits coagulation factor XIa, thus contributing to prevent carotid and cerebral artery thrombosis [32,33]. This protease-inhibitor potential should be further explored in different tissues (also in CNS). Interestingly, soluble APP inhibits and binds tightly to active trypsin released from cancer cells . This finding reinforces the protease inhibitor role of the soluble form of the protein and opens the possibility to consider soluble APP as target in malignancies. PN-II has been also reported to interact and mediate the cellular binding of the epidermal growth factor binding protein, another serine protease [35-38]. APP synthesis and proteolytic processing already occur in embryonic neural differentiation [39-41]. Furthermore, soluble APP may promote neurite outgrowth among other trophic actions . The potential autocrine/paracrine role would fit with neurotrophin p75 being the receptor that mediates the neurotrophic actions of soluble APP . Interestingly, a tight binding of PN-II to the gamma subunit of nerve growth factor allows this factor to interact with cells . Soluble APP also interacts with transforming growth factor (TFG) beta 2 . This interaction points to APP being involved in one of the main pathways regulating differentiation and growth in many tissues. Actually an important function in neural development has been assigned to APP (See , for review). In Drosophila melanogaster, the homologous gene to mammalian APP predicts a protein of 886 amino acids and belongs to the vnd locus, which is essential in flies for embryonic nervous system development . To our knowledge no systematic approach to find soluble APP binding proteins in human fluids or tissues has been attempted. In this regard, the study performed by Golabek et al., (1995) to detect Aß-peptide-interacting partners may be an example to follow . The length of the predicted APP sequence, 770 amino acids, is equal in many mammals and the overlap of the mouse and human sequences is quite unique. This equal length and almost equal sequence indicates that the proteolytic processing is important for physiological APP function. The biochemical data and scattered studies suggest diverse roles for APP and for the molecules resulting from its proteolytic degradation. APP and derivatives may be from adhesion molecules to hormones/neurotransmitters. Glycosylation is one important feature of APP that may be useful to ascertain its physiological role. The possibility of APP glycosylation as a blood biomarker in AD deserves attention. The authors declare no conflict of interests. The authors declare the article as being a perspectice article in which basic/generic data on APP has been, in part, retrieved from public available databases in which appropriate acknowledgements/references are provided. The authors declare that this paper is neither a general review on APP nor a review on any particular aspect of APP biology. 1 Podlisny MB, Tolan DR, Selkoe DJ (1991) Homology of the amyloid beta protein precursor in monkey and human supports a primate model for beta amyloidosis in Alzheimer's disease. Am J Pathol 138: 1423-35. 2Kang J, Lemaire HG, Unterbeck A, Salbaum JM, Masters CL, et al. (1987) The precursor of Alzheimer's disease amyloid A4 protein resembles a cell-surface receptor. Nature 325: 733-6. 3 Kitaguchi N, Takahashi Y, Tokushima Y, Shiojiri S, Ito H (1988) Novel precursor of Alzheimer's disease amyloid protein shows protease inhibitory activity. Nature 331: 530-2. 4Ponte P, Gonzalez-DeWhitt P, Schilling J, Miller J, Hsu D, et al. (1988) A new A4 amyloid mRNA contains a domain homologous to serine proteinase inhibitors. Nature 331: 525-7. 5Tanzi RE, McClatchey AI, Lamperti ED, Villa-Komaroff L, Gusella JF, et al. (1988) Protease inhibitor domain encoded by an amyloid protein precursor mRNA associated with Alzheimer's disease. Nature 331: 528-30. 6 de Sauvage F, Octave JN (1989) A novel mRNA of the A4 amyloid precursor gene coding for a possibly secreted protein. Science 245: 651-3. 7 Oltersdorf T, Ward PJ, Henriksson T, Beattie EC, Neve R, et al. (1990) The Alzheimer amyloid precursor protein. Identification of a stable intermediate in the biosynthetic/degradative pathway. J Biol Chem 265: 4492-7. 8Schedin-Weiss S, Winblad Tjernberg LO (2014) The role of protein glycosylation in Alzheimer disease. FEBS J 281: 46-62. 9 Rostenberg I, Guizar-Vazquez J, Penaloza R (1978) Altered carbohydrate content of alpha1-antitrypsin in patients with cancer. J Natl Cancer Inst 61: 961-5. 10Hao P, Ren Y, Xie Y (2010) An improved protocol for N-glycosylation analysis of gel-separated sialylated glycoproteins by MALDI-TOF/TOF. PLoS One 5: e15096. 11Franco R, Cedazo-Minguez A (2014) Successful therapies for Alzheimer's disease: why so many in animal models and none in humans? Front Pharmacol 5: 146. 12 Weidemann A, Konig G, Bunke D, Fischer P, Salbaum JM, et al. (1989) Identification, biogenesis, and localization of precursors of Alzheimer's disease A4 amyloid protein. Cell 57: 115-26. 13 Dewji NN, Shelton ER, Adler MJ, Chan HW, Seegmiller JE, et al. (1990) Processing of Alzheimer's disease-associated beta-amyloid precursor protein. J Mol Neurosci 2: 19-27. 14 Breen KC, Bruce M, Anderton BH (1991) Beta amyloid precursor protein mediates neuronal cell-cell and cell-surface adhesion. J Neurosci Res 28: 90-100. 15 Coulson EJ, Barrett GL, Storey E, Bartlett PF, Beyreuther K, et al. (1997) Down-regulation of the amyloid protein precursor of Alzheimer's disease by antisense oligonucleotides reduces neuronal adhesion to specific substrata. Brain Res 770: 72-80. 16Bush AI, Beyreuther K, Masters CL (1993) The beta A4 amyloid protein precursor in human circulation. Ann N Y Acad Sci 695: 175-82. 17 Nishi M, Chan SJ, Nagamatsu S, Bell GI, Steiner DF (1989) Conservation of the sequence of islet amyloid polypeptide in five mammals is consistent with its putative role as an islet hormone. Proc Natl Acad Sci USA 86: 5738-42. 18 Moir RD, Martins RN, Bush AI, Small DH, Milward EA, et al. (1992) Human brain beta A4 amyloid protein precursor of Alzheimer's disease: purification and partial characterization. J Neurochem 59: 1490-8. 19 Blair JA, Siedlak SL, Wolfram JA, Nunomura A, Castellani RJ, et al. (2014) Accumulation of Intraneuronal Amyloid-beta is Common in Normal Brain. Curr Alzheimer Res 11: 317-24. 20 Joseph J, Shukitt-Hale B, Denisova NA, Martin A, Perry G, et al. (2001) Copernicus revisited: amyloid beta in Alzheimer's disease. Neurobiol Aging 22: 131-46. 21Herrera C, Morimoto C, Blanco J, Mallol J, Arenzana F, et al. (2001) Comodulation of CXCR4 and CD26 in human lymphocytes. J Biol Chem 276: 19532-9. 22Valenzuela A, Blanco J, Callebaut C, Jacotot E, Lluis C, et al. (1997) Adenosine deaminase binding to human CD26 is inhibited by HIV-1 envelope glycoprotein gp120 and viral particles. J Immunol 158: 3721-9. 23 Hong WJ, Petell JK, Swank D, Sanford J, Hixson DC, et al. (1989) Expression of dipeptidyl peptidase IV in rat tissues is mainly regulated at the mRNA levels. Exp Cell Res 182: 256-66. 24 McCaughan GW, Wickson JE, Creswick PF, Gorrell MD (1990) Identification of the bile canalicular cell surface molecule GP110 as the ectopeptidase dipeptidyl peptidase IV: an analysis by tissue distribution, purification and N-terminal amino acid sequence. Hepatology 11: 534-44. 25 Marguet D, Bernard AM, Vivier I, Darmoul D, Naquet P, et al. (1992) cDNA cloning for mouse thymocyte-activating molecule. A multifunctional ecto-dipeptidyl peptidase IV (CD26) included in a subgroup of serine proteases. J Biol Chem 267: 2200-8. 26 Pacheco R, Martinez-Navio JM, Lejeune M, Climent N, Oliva H, et al. (2005) CD26, adenosine deaminase, and adenosine receptors mediate costimulatory signals in the immunological synapse. Proc Natl Acad Sci USA 102: 9583-8. 27Andy RJ, Kornfeld R (1984) Biosynthesis of the adenosine deaminase-binding protein in human fibroblasts and hepatoma cells. J Biol Chem 259: 9832-9. 28 Oravecz T, Pall M, Roderiquez G, Gorrell MD, Ditto M, et al. (1997) Regulation of the receptor specificity and function of the chemokine RANTES (regulated on activation, normal T cell expressed and secreted) by dipeptidyl peptidase IV (CD26)-mediated cleavage. J Exp Med 186: 1865-72. 29 Proost P, De Meester I, Schols D, Struyf S, Lambeir AM, et al. (1998) Amino-terminal truncation of chemokines by CD26/dipeptidyl-peptidase IV. Conversion of RANTES into a potent inhibitor of monocyte chemotaxis and HIV-1-infection. J Biol Chem 273: 7222-7. 30 Oltersdorf T, Fritz LC, Schenk DB, Lieberburg I, Johnson-Wood KL, et al. (1989) The secreted form of the Alzheimer's amyloid precursor protein with the Kunitz domain is protease nexin-II. Nature 341: 144-7. 31Van Nostrand WE, Schmaier AH, Wagner SL (1992) Potential role of protease nexin-2/amyloid beta-protein precursor as a cerebral anticoagulant. Ann N Y Acad Sci 674: 243-52. 32Smith RP, Higuchi DA, Broze GJ (1990) Platelet coagulation factor XIa-inhibitor, a form of Alzheimer amyloid precursor protein. Science 248: 1126-8. 33Wu W, Li H, Navaneetham D, Reichenbach ZW, Tuma RF, et al. (2012) The kunitz protease inhibitor domain of protease nexin-2 inhibits factor XIa and murine carotid artery and middle cerebral artery thrombosis. Blood 120: 671-7. 34 Miyata S, Koshikawa N, Higashi S, Miyagi Y, Nagashima Y, et al. (1999) Expression of trypsin in human cancer cell lines and cancer tissues and its tight binding to soluble form of Alzheimer amyloid precursor protein in culture. J Biochem 125: 1067-76. 35Green DA, Moore JB, (1980) Demonstration of protease activity for epidermal growth factor-binding protein. Arch Biochem Biophys 202: 201-9. 36 Knauer DJ, Cunningham DD (1982) Epidermal growth factor carrier protein binds to cells via a complex with released carried protein nexin. Proc Natl Acad Sci USA 79: 2310-4. 37 Knauer DJ, Thompson JA, Cunningham DD (1983) Protease nexins: cell-secreted proteins that mediate the binding, internalization, and degradation of regulatory serine proteases. J Cell Physiol 117: 385-96. 38 Van Nostrand WE, Cunningham DD (1987) Purification of protease nexin II from human fibroblasts. J Biol Chem 262: 8508-14. 39Loffler J, Huber G (1992) Beta-amyloid precursor protein isoforms in various rat brain regions and during brain development. J Neurochem 59: 1316-24. 40 Salbaum JM, Ruddle FH (1994) Embryonic expression pattern of amyloid protein precursor suggests a role in differentiation of specific subsets of neurons. J Exp Zool 269: 116-27. 41 Guenette S, Chang Y, Hiesberger T, Richardson JA, Eckman CB, et al. (2006) Essential roles for the FE65 amyloid precursor protein-interacting proteins in brain development. EMBO J 25: 420-31. 42 Mattson MP (1997)Cellular actions of beta-amyloid precursor protein and its soluble and fibrillogenic derivatives. Physiol Rev 77: 1081-132. 43Hasebe N, Fujita Y, Ueno M, Yoshimura K, Fujino Y, et al. (2013) Soluble beta-amyloid Precursor Protein Alpha binds to p75 neurotrophin receptor to promote neurite outgrowth. PLoS One 8: e82321. 44 Knauer DJ, Scaparro KM, Cunningham DD (1982) The gamma subunit of 7 S nerve growth factor binds to cells via complexes formed with two cell-secreted nexins. J Biol Chem 257: 15098-104. 45 Bodmer S, Podlisny MB, Selkoe DJ, Heid I, Fontana A (1990) Transforming growth factor-beta bound to soluble derivatives of the beta amyloid precursor protein of Alzheimer's disease. Biochem Biophys Res Commun 171: 890-7. 46Nicolas M, Hassan BA (2014) Amyloid precursor protein and neural development. Development 141: 2543-8. 47 Rosen DR, Martin-Morris L, Luo LQ, White K (1989) A Drosophila gene encoding a protein resembling the human beta-amyloid protein precursor. Proc Natl Acad Sci USA 86: 2478-82. 48Golabek A, Marques MA, Lalowski M, Wisniewski T (1995) Amyloid beta binding proteins in vitro and in normal human cerebrospinal fluid. Neurosci Lett 191: 79-82. 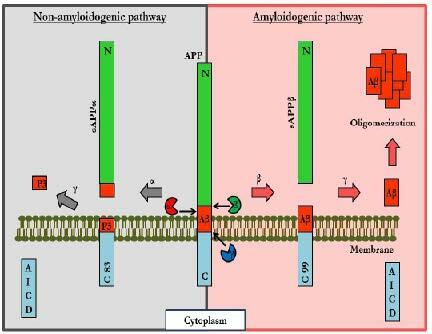 Figure 1:Amyloidogenic and non-amyloidogenic APP-processing pathways. α, ß and γ indicate processing by, respectively, α, ß and γ secretases. C83 and C99 are C-terminal fragments of respectively, 83 and 99 kDa. sAPP is soluble APP. Aß: ß-amyloid peptide. AICD: Short peptides from the intracellular domain of APP. 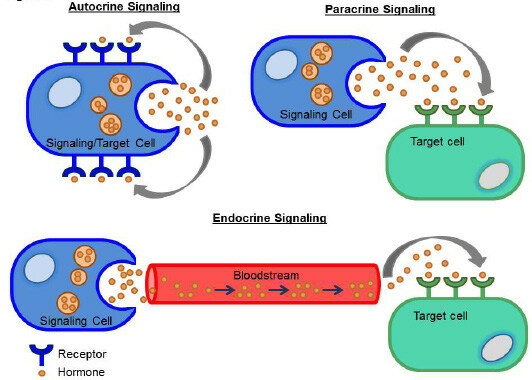 Figure 2: Scheme of autocrine, paracrine and endocrine hormonal action.